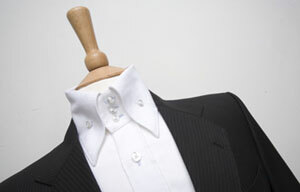 On the fifth floor of an office block near Liverpool Street station is the measuring room of A Suit That Fits – a UK suit and shirt ordering service that has been advertising widely across London in recent months. Actually, that’s not true. You have to take the lift to the fifth floor and then go up another set of stairs. But at the top is a small studio occupied by two very personable, young measurers and a good few books of cloth. A colleague of mine had decided to try the service and I wanted to accompany him, fascinated by the new made-to-measure or bespoke services that are being set up as men take a greater interest in suits and an even greater interest in how they fit. The facts: A Suit That Fits takes your measurements at its London studio, advises you on fit and cloth and then has the suit made by tailors in Nepal. Each customer has his own paper pattern cut – to that extent it is bespoke. But there is no fitting. The suit comes back complete and is adjusted in the UK. The company does have a ‘perfect fit’ guarantee, however, and will change the finished garment ad infinitum. The number of measurements take is good, with several around the leg and more than two across the jacket body. Some only measure the waist and length of trousers, and only the chest and waist in a jacket. Prices start at ₤200. There is, however, a ₤25 measuring fee and quite a few extras that cost – the number of buttons, pockets and vents, for example. Delivery can also be guaranteed in four weeks by an additional cost of ₤75. Otherwise it takes six to eight weeks. My friend wanted the tuxedo he was having made to be mohair, which added another ₤100. In his case, the extras cost over ₤50 on top of that. So a basic suit would effectively start around ₤275. A Suit That Fits offers its customers a choice of three fits – regular, slim or very slim. Each gives a certain degree of “tolerance” around places such as the chest, waist and arms. While this may seem like opaque shorthand to purists out there, I sympathise. Few men going in to be measured will know exactly what they want. And unlike Savile Row, they are less likely to trust the tailor and his house style. This system, therefore, and the recommendation that you bring in a jacket that you like the fit of, fills the communication gap between client and tailor. The finished suits awaiting collection showed a OK level of handiwork – about the level I would expect from mid-range tailors in Vietnam, Hong Kong etc. The cloth was nothing spectacular, but then for ₤200 in London you would get a similar quality that wouldn’t fit. So the service is best seen as a way for people in London to access the kind of service they could get from these tailors in parts of Asia. I look forward to seeing my colleague’s complete suit and assessing its fit. You can follow the discussion on Review: A Suit That Fits by entering your email address in the box below. You will then receive an email every time a new comment is added. These will also contain a link to a page where you can stop the alerts, and remove all of your related data from the site. hmmm interesting. Might be a good idea, as most affordable off the rack suits fit like a sack. I look forward to hearing the results. Thank you for the review Simon. Please do let us know what you (and your colleague) think of the suit when it arrives! I ordered a couple of suits from AStF. My only quibble would be that certain details couldn’t be changed, namely the lapels. The lining was also of a fairly poor quality, even compared to the wear-into-the-ground suits I wore when I just started work. This was a couple of years ago and the customer care was exceptional. I will be in London for about 1 week and 6 days, do I have enough time to get a suit made and altered at least once when it comes back? You may have misunderstood – A Suit That Fits has its suits made in Nepal, which takes a minimum of four weeks (and that with an extra charge for the speed).